Our dunk tank is the most economical, professionally made dunk tank in the market. The dunk tank is not trailer-mounted, but does have convenient, heavy-duty dolly wheels for ease of movement. This dunk tank functions the same as our traditional dunk tank, but does not have the trailer attached to it. (It does, however, have heavy-duty dolly wheels.) By eliminating the axle and wheels and reducing the amount of steel required, we are able to dramatically lower the cost of the unit. 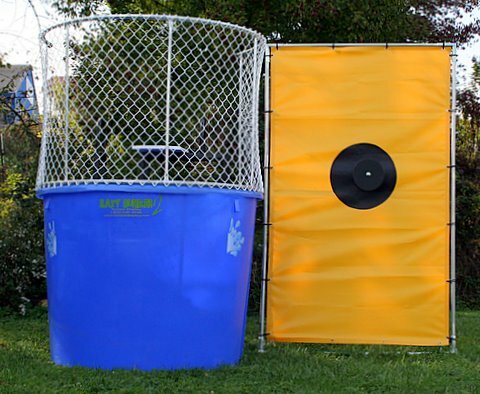 By setting up the dunk tank and dunking the fireman, mayor, principal, pastor or pretty girl, your group can raise a considerable amount of money. Plus, you can also raise money by lending it to other organizations in exchange for a cut of the profits. Size: Height: 8ft. Width: 11ft. Depth: 5ft.